How much do you love coffee cake? 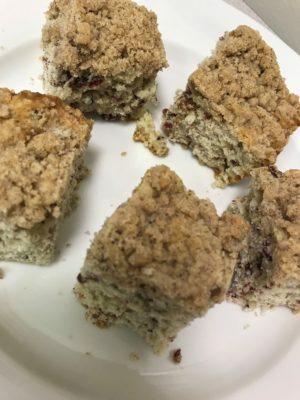 You'll love it even more with this delicious fruit crisp coffee cake recipe! Turn your coffee cake into a fruity sensation. We use freeze dried fruit to add extra flavor. Preheat oven to 375 F and grease a 9 x 9 square pan or cake pan. Mix the dry ingredients for the batter (flour, baking powder, salt.) In another bowl, mix the sugar, butter, & vanilla extract. Add the flour mixture to the wet (sugar/butter) mixture while alternating with the milk. Do this until the flour mixture, wet mixture and milk are combined. Dump the 3 bags of fruit crisps into the batter (break them up into smaller pieces, if desired). Fold into the batter and then allow to sit for 10 minutes. While the batter sits, mix the sugar, flour & cinnamon and then cut the butter in. Do this until it becomes a crumbly mixture. Take the batter and spread into prepare baking pan. Sprinkle the topping mixture on top and bake for 30-35 minutes or until a tooth pick comes out clean.